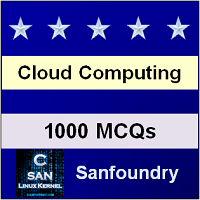 This set of Cloud Computing Multiple Choice Questions & Answers (MCQs) focuses on “Cloud Storage in the Digital Universe”. 1. Which of the following is storage data interchange interface for stored data objects ? Explanation: OCCI stands for Open Cloud Computing Interface. Explanation: Mapping process involves determining the critical application features and then matching them to the cloud provider’s offering to see if those features can be supported. 3. ________ data represents more than 50 percent of the data created every day. Explanation: Lots of shadow data does get retained, having never been touched by a human being. 4. Cloud storage data usage in the year 2020 is estimated to be ___ percent resident by IDC. Explanation: There will be a steady growth of cloud storage at the expense of online storage over the next decade. Explanation: Cloud storage can be either unmanaged or managed. 6. Which of the following system does not provision storage to most users ? Explanation: Cloud storage is storage accessed by a Web service API. 7. The addition of a software package on top of a cloud storage volume makes most cloud storage offerings conform to a ________ as a Service model. Explanation: Most users interact with cloud storage using backup, synchronization, archiving, staging, caching, or some other sort of software. 8. How many categories of storage devices broadly exist in cloud ? Explanation: Storage devices may be broadly categorized as either block storage devices or file storage devices. 9. Which of the following storage devices exposes its storage to clients as Raw storage that can be partitioned to create volumes ? Explanation: It is up to the operating system to create and manage the file system. 10. Which of the following impose additional overhead on clients and offer faster transfer ? Explanation: File-oriented storage devices are generally slower, but require less overhead from attached clients.